F&C Investment Trust (FCIT) is the world’s oldest investment trust. The 150-year-old behemoth is on course for its 48th consecutive year of dividend increases having paid a dividend every year since launch. Income is not the main focus for the manager, however, and it is positioned to deliver long-term growth in capital via an internationally-diversified portfolio. The portfolio is constructed with inputs from both BMO’s specialist teams and third-party managers and this includes investments in both listed and unlisted securities. The manager, Paul Niven, believes this combination of public and private companies is a key feature of the trust, which help reduce risk and limit the volatility of investment returns. The trust is well diversified across geographies and sectors and the board has not placed any specific geographic or industry sector exposure limits for the publicly listed equities. The largest geographical weighting is to North America (53.3%), followed by Europe ex UK (17.1%) and emerging markets (11%). 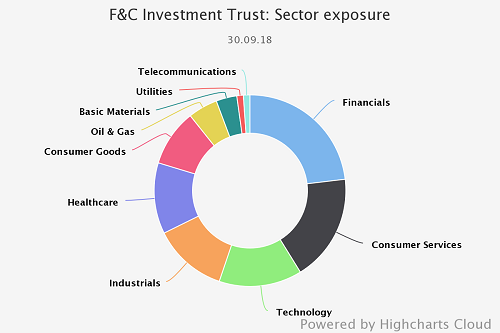 In terms of listed equity sector exposure, financials make up close to a quarter of the exposure and consumer services (18.2%) and technology (18.1%) also make up considerable portions of the portfolio. Since taking over the trust in 2014, Paul has delivered decent NAV returns, outperforming the benchmark FTSE All World (69.4%) by c.6% and the IA Global sector (55.1%). That said, the trust has underperformed the Morningstar Global closed end peer group by 3%. 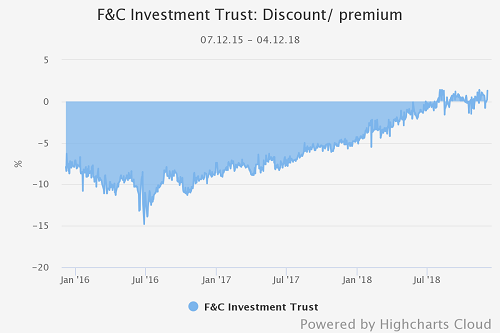 Over the past two years the trust has seen the discount narrow considerably, to a point where the trust is currently trading on a slight premium (0.2%). Since the start of the year the discount/ premium has ranged between -5.7% and 1.4% and the one- year average has been -1.6%, marginally narrower than the sector average of -2.5%. an internationally diversified portfolio. Earlier in the year the trust celebrated its 150th anniversary, a period that has been marked by the continuous evolution of the portfolio. 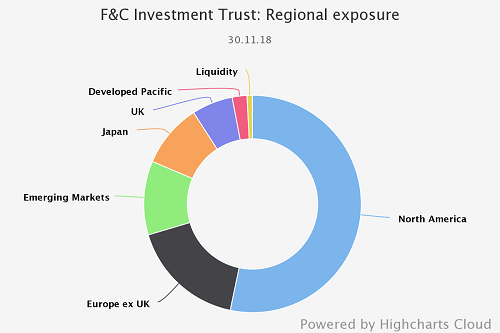 Initially, the constituents of the portfolio were predominantly emerging market bonds with investments spanning Europe, the Middle East, New Zealand, South America and North America. Over time, the portfolio has evolved and expanded to include corporate bonds, equities and private equity. As can be seen below, F&C’s portfolio is made up of inputs from both BMO’s specialist teams and third-party managers, and Paul believes the combination of listed and unlisted securities is a key feature of the trust which helps both to reduce risk and to limit the volatility of investment returns. 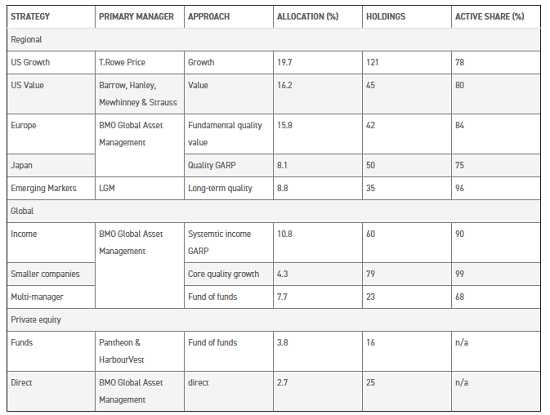 BMO anticipates there being a low turnover of the primary managers, though there has been some re-arranging within the private equity portion in recent times. In particular, one can expect the continuation of significant cost savings, as the trust’s historic private equity fund-of-fund investments in HarbourVest and Pantheon are run off. In the future, private equity investments will be more focused and opportunistic, and predominantly invested directly through BMO’s global resources. 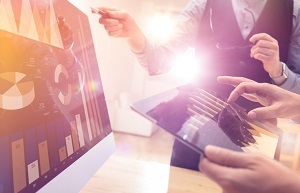 The trust uses the FTSE All-World index as a benchmark for performance and, although Paul doesn’t follow the benchmark allocations, he remains benchmark aware. Risk management is a particularly prevalent aspect of the portfolio and is achieved via diversification across geographies and sectors. As can be seen below, through diversifying across managers, investors can benefit from the same levels of returns but reduced total risk. Within the general policy of maintaining this diversification, there are no specific geographic or industry sector exposure limits for the publicly-listed equities. With this said, no single investment can exceed 10% of the value of the portfolio, and no unlisted security can be greater than 5% of the value of the portfolio. Alongside listed and unlisted securities, the manager is also allowed to use derivatives for income enhancement. As can be seen below the largest geographical weighting is North America (53.3%), followed by Europe ex UK (17.1%) and emerging markets (11%). In terms of listed equity sector exposure, financials make up close to a quarter of the exposure and consumer services (18.2%) and technology (18.1%) also make up considerable portions of the portfolio. Paul remains optimistic for the outlook of global equities, and believes that the bull market will continue into the near future, largely due to the strong corporate earnings growth. He notes there are macroeconomic issues to consider, in particular in the US where the trust has the majority of its portfolio. Although interest payments have been low, there have been low corporate taxes, the labour power has been weak and corporations have been enjoying monopoly profits, there are significant headwinds facing the region, including the lateness of cycle, increasing rates, indications from yield curve and the timing of the fiscal boost from Trump. Outside the US, Paul recognises that Europe is also showing a worrying inability to sustain earnings growth despite decent fundamentals, but the emerging markets have been oversold during 2018 and has limited risk of contagion at present. The manager is permitted to gear up to 20% of net assets, and since 2012 the gearing has varied between 7 % and 14%. Since the start of the year this has been toward the bottom end of the range, averaging 7.4%. Since 2013 the cost of gearing has substantially reduced, principally due to a change of debenture in 2014 – which had a fixed rate of 11%. This has meant that the weighted average cost of debt has decreased from 7.1% in 2013 to 2.8% in 2018. 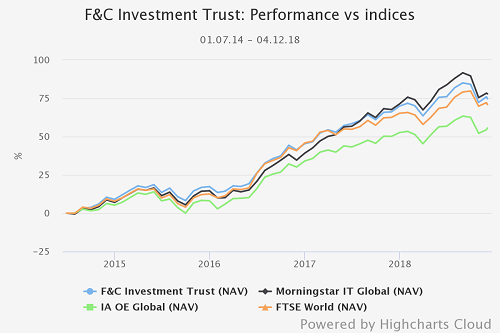 The trust has delivered strong NAV returns (c.75%) since Paul took over the portfolio in 2014, and has outperformed the benchmark FTSE All World (69.4%) and the IA Global sector (55.1%) over the four years. In comparison to the Morningstar closed end peer group, the trust has marginally underperformed (-3%). Looking in greater detail (with the FTSE World as the calculation benchmark) the manager has added an alpha of 1.33, putting the trust in the middle of the AIC peer group for excess return relative to the benchmark. 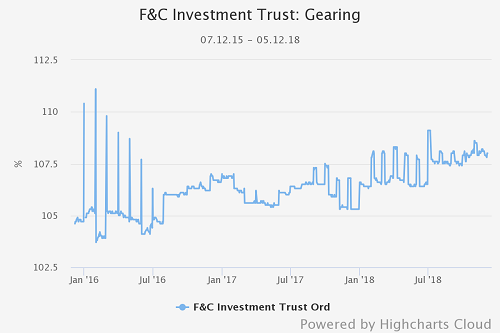 As one might expect with the emphasis on risk management, over the same period the trust had a relatively low standard deviation of (14.33%), close to 2% less than the sector average of 16.3%. 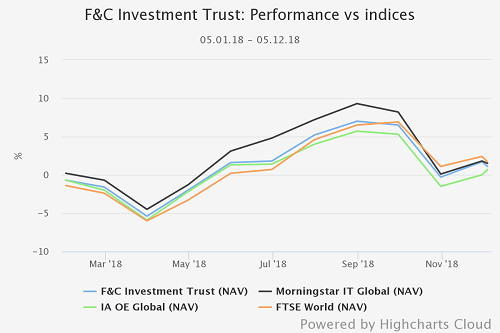 In more recent times, the trust has outperformed the IA Global sector (3.6%) but this time underperformed the FTSE All World (6.6%) as well as the Morningstar Global peer group (7%), delivering a return of 6%. FCIT has a paid a dividend every year since 1868. This includes 47 years of consecutive dividend increases, making it the fifth highest number of consecutive dividend increases of all the AIC’s ‘dividend heroes’. The 2017 dividend equated to 10.40p per share, this was 5.6% higher than the 2016 dividend, and was over 1.1x covered. The net revenue return per share rose 7.5%, to 7.78p, in the first six months of the year on the equivalent period of 2017. Within this, there was a rise in special dividends, which rose to £3.9m, from £2.1m in the comparative period of 2017. Earlier this month, the board announced the third dividend for 2018, a payment of 2.8p per share, which compares to a 2.7p dividend for the third interim this time last year. 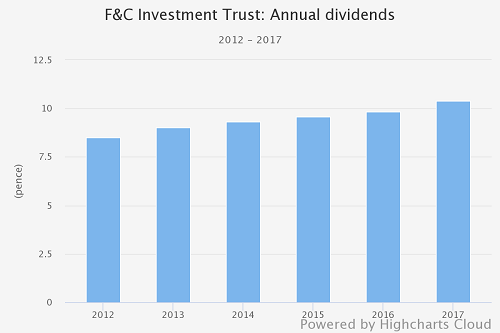 It is the intention of the board to deliver another rise in dividends for 2018, which will mark the forty-eighth year of increases in annual dividends. The trust has an impressive record of long-term managers, and over the past 150 years there have only been 11 different managers. This includes only three since 1969. Currently at the helm is Paul Niven, who has managed the portfolio since July of 2014. Paul is also a managing director and head of Multi-Asset Solutions – a £30bn AUM business within BMO. Paul has worked at BMO since 1999, after undertaking a fund management position in Pacific Basin Equities. He has had responsibility for the management of Multi-Asset mandates within the group since 2002 (including large portfolios for insurance clients) and is Chair of the Investment Policy Group. Over the past two years FCIT has seen the discount narrow considerably, as can be seen below. Since the start of the year the discount/ premium has ranged between -5.7% and 1.4% and the current premium of 0.2% compares to a one- year average of -1.6%, and the sector average of -2.5%. Previously a threshold of -10% was identified by the board, but this was reduced to -7.5%, and has now been completely removed. With this said, the board will continue to use buybacks if it sees fit. As can be seen below, over the past two years the amount of repurchases has significantly reduced, and so far this year 100,000 shares have been issued. The trust has an annual management fee of 0.365% of market cap paid to BMO Global Asset Management and the trust also pays direct fees to its external managers. The ongoing charge of 0.79% is marginally greater than the AIC global arithmetic mean of 0.77%, but 0.18% more expensive than the weighted average.